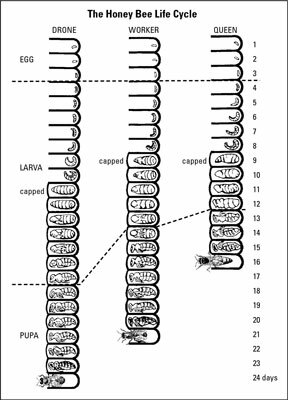 Honey bees develop in four distinct life cycle phases: egg, larva, pupa, and adult. The total development time varies a bit among the three castes of bees, but the basic miraculous process is the same: 24 days for drones, 21 days for worker bees, and 16 days for queens. The honey bee metamorphosis begins when the queen lays an egg. You should know how to spot eggs, because that is one of the most basic and important skills you need to develop as a beekeeper. It isn’t an easy task, because the eggs are mighty tiny (only about 1.7 millimeters long). But finding eggs is one of the surest ways to confirm that your queen is alive and well. It’s a skill you’ll use just about every time you visit your hive. 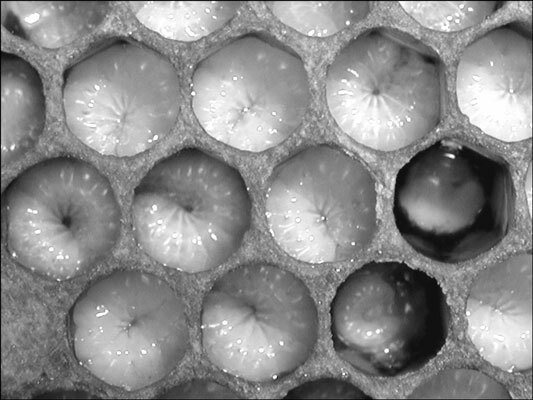 The queen lays a single egg in each cell that has been cleaned and prepared by the workers to raise new brood. The cell must be spotless, or she moves on to another one. 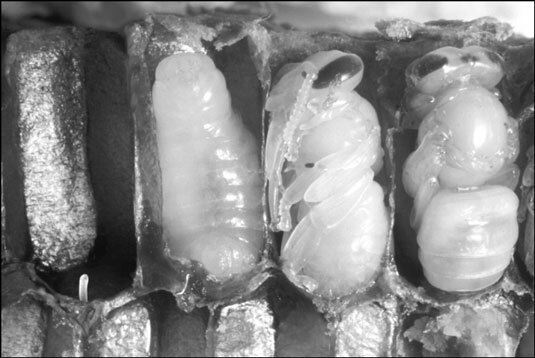 Note the rice-like shape of the eggs and how the queen has positioned them “standing up” in the cell. If she chooses a standard worker-size cell, she releases a fertilized egg into the cell. That egg develops into a worker bee (female). But if she chooses a wider drone-size cell, the queen releases a nonfertilized egg. That egg develops into a drone bee (male). The workers that build the cells are the ones that regulate the ratio of female worker bees to male drone bees. They do this by building smaller cells for female worker bees, and larger cells for male drone bees. The queen positions the egg in an upright position (standing on end) at the bottom of a cell. That’s why they’re so hard to see. When you look straight down into the cell, you’re looking at the miniscule diameter of the egg, which is only 0.4 of a millimeter wide. Eggs are much easier to spot on a bright sunny day. Hold the comb at a slight angle, and with the sun behind you and shining over your shoulder, illuminate the deep recesses of the cell. The eggs are translucent white, and resemble a miniature grain of rice. These helpless little creatures have voracious appetites, consuming 1,300 meals a day. The nurse bees first feed the larvae royal jelly, and later they’re weaned to a mixture of honey and pollen (sometimes referred to as bee bread). Within just five days, they are 1,570 times larger than their original size. 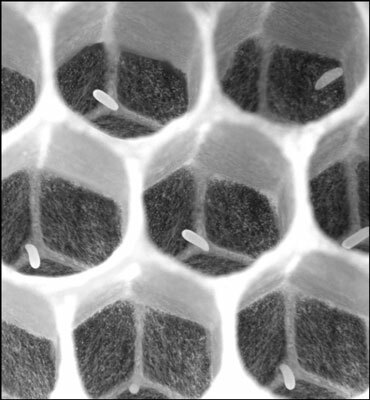 At this time the worker bees seal the larvae in the cell with a porous capping of tan beeswax. 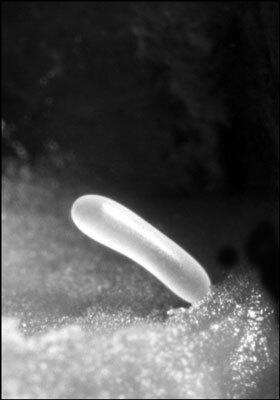 Once sealed in, the larvae spin a cocoon around their bodies. The larva is now officially a pupa (the plural is pupae). Here’s where things really begin to happen. Of course the transformations now taking place are hidden from sight under the wax cappings. But if you could, you’d see that this little creature is beginning to take on the familiar features of an adult bee. The eyes, legs, and wings take shape. Coloration begins with the eyes: first pink, then purple, then black. Finally, the fine hairs that cover the bee’s body develop. After 12 days, the now adult bee chews her way through the wax capping to join her sisters and brothers. Opened cells reveal an egg and developing pupae. This chart shows the daily development cycle of all three castes, from egg to adult.